Ridley Scott returns to the sci-fi genre that has served him so well for a trip to Mars that sits somewhere between Castaway and Gravity. Matt Damon plays astronaut and botanist Mark Watney, on a Mars expedition with five others. When a storm hits the Red Planet, Watney is hit by an antenna propelled by the strong winds and his crew are forced to blast off without him and begin their journey home. Stuck on Mars with limited supplies and no guarantee of making contact with Earth, Watney decides to apply science to his situation and attempt to grow his own food on a lifeless planet. Mars has not been a happy place for blockbuster movies. When Red Planet and Mission to Mars were released in 1999 to dismissive responses from audiences, there seemed to be little need to revisit the setting. That view was supported when $250 million Disney flop John Carter was ignored by cinemagoers in 2012 leading to a near $100 million loss for the house of mouse. Yet, despite Mars seeming like it’s off limits for successful movie settings, Scott has managed to buck the trend and deliver a film stacked full of science that keeps you rooting for an underdog battling for survial. The Martian should feel like an incredible feat of human survival, but its alien setting struggles to generate a truly human connection. 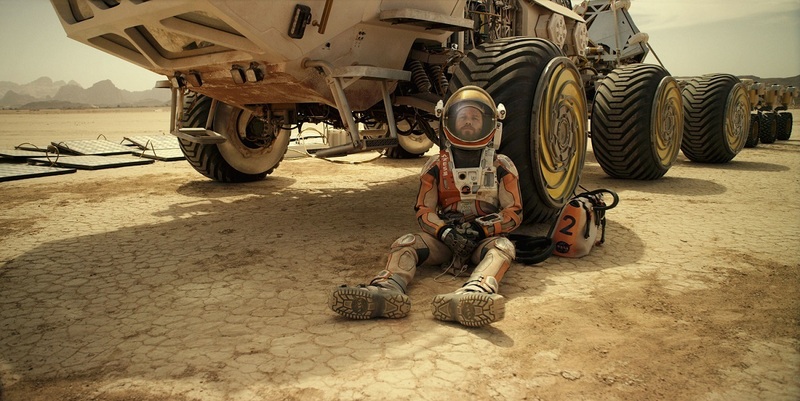 At its heart, The Martian plays on the idea of being marooned and having to make the most of what you’ve got with little or no help. Once Watney has been left for dead, he starts recording a video diary from which we glean his scientific thinking while the dramatic red Mars landscape speaks for itself - this is a gorgeous place to be stuck. There’s plenty of humour - Watney has a breezey personality when complaining of only having disco music to listen to and Happy Days to watch - yet there is also a few hairy moments such as when he has to surgically staple a wound on his stomach together and conduct experiments where one false move could result in his demise. His biggest success is growing potatoes, and seeing his method unfold is like watching a National Geographic show. Weaved into the on-Mars action are discussions back on Earth between NASA director Teddy Sanders (Jeff Daniels) and his team including earnest Mars mission director Vincent Kapoor (Chiwetel Ejiofor), jet propulsion expert Bruce Ng (Benedict Wong), quirky media relations director Annie Montrose (Kristen Wiig) and wry flight director Mitch Henderson (Sean Bean) as they first discover Watney’s plight and then seek to find a way to help him. These talks provide the thrust of the film as we learn of Watney’s limited options and become aware of the deadline to get help to him. We also get insights from Watney’s crew on their journey back from Mars led by crew-loyal Melissa Lewis (Jessica Chastain) adding up to a strong supporting cast. Yet, while The Martian makes for compelling viewing and revels in its accuracy when Watney and NASA make their best efforts to ‘science the sh!t’ out of everything, long passages of time are glossed over - including their mental effects when dealing with the loneliness of space travel - which would have given the predictable plot added emotional weight. Instead there is a little too much of jovial Watney to take seriously, unlike the superior standed-in-space movies of Apollo 13 and Gravity which provide more edge-of-the-seat intensity. The Martian should feel like an incredible feat of human survival, but its alien setting struggles to generate a truly human connection. That said, watching Damon on top form with little-to-no co-stars on screen with him plus Scott producing a fine imaginging of Mars life is hugely enjoyable and a massive step forward from previous attempts to make Earth’s neighbour the subject of a decent movie.